Restroom Depot offers powder coated steel bathroom partitions that are economically priced but without any compromises as to their quality. 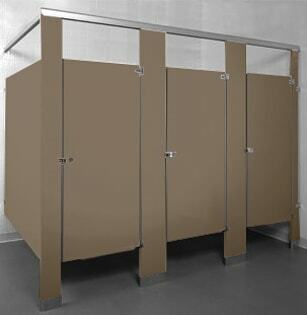 Metal toilet partitions which have become the standard for durable quality at an affordable price. 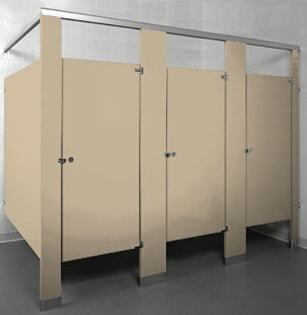 Metal restroom stalls are one of the most common partition materials from manufacturers. We have the best price on all toilet stalls and styles. Baked enamel or powder coated bathroom partitions from One Point Partitions are the most economical materials available. Toilet partitions come in a wide variety of colors and mounting styles, including floor mounted overhead-braced, floor braced, ceiling hung, and floor to ceiling hung. 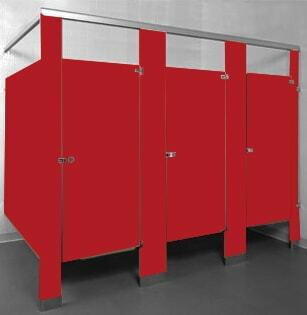 Restroom Depot is proud to offer 48-hour shipping from various manufacturers. 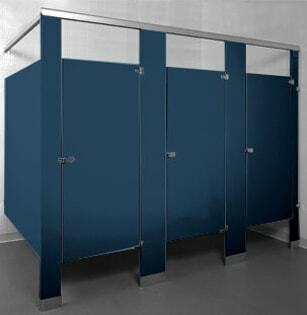 Baked enamel partitions are great for budget conscious customers with low moisture restrooms. This material provides for moderate protection from vandalism, so in most cases it’s not the best choice for applications with that potential. Office buildings, restaurants, and retail stores are a few examples of application types that commonly require baked enamel steel restroom partitions. 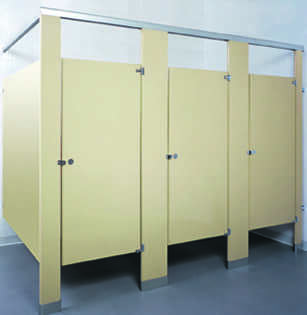 Powder coated steel bathroom stalls are constructed with high quality steel and feature an interlocking strip welded at each corner providing extra strength. Powder coating allows for electrically charged panels to be covered in a hybrid epoxy/polyester powder and then baked. This process ensures that the partitions will have a hard, smooth, run free finish. These partitions will resist impact, abrasions, chemicals, detergents and acids. Vandal resistant- Powder coated surfaces allows the use of commercial graffiti removers to completely eliminate graffiti without causing damage to the finish. The powder coating retains its original brilliance and no ghost of the graffiti is left behind!